DeKalb County Georgia. Source: Google Maps. The state Legislature is looking to reform the convoluted annexation and cityhood process that vexed DeKalb County delegation this year. The House has appointed a study committee on Annexation, Deannexation, and Incorporation. All of its five members are Republican, except state Rep. Mary Margaret Oliver, D-Decatur. It’s a discussion that could influence how new cities are formed and how annexations occur throughout the state. It certainly isn’t going away. Depending on how new city proposals do at the ballot this year, plans to annex unincorporated areas of DeKalb into existing or new cities could be resurrected in the 2016 session. 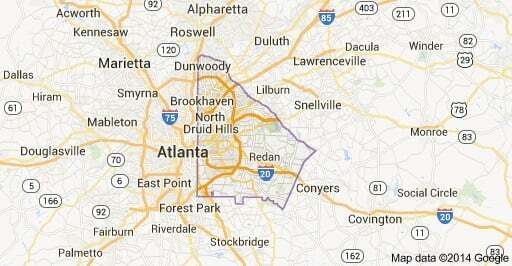 Bills allowing for a vote on incorporating new cities of Tucker and LaVista Hills this November prevailed in the 2015 session, while annexation plans for Decatur, Atlanta and Avondale Estates fell by the wayside. While that sounds straightforward, the path to getting there was anything but. Legislators debated which proposals should take priority when they considered the overlapping boundaries of annexation and cityhood proposals. There are several methods under state law for annexing unincorporated territory into a new city. The Legislature also bent the rules to allow Tucker and LaVista Hills to move forward in this year’s session, instead of making the cities wait two years. LaVista Hills combined the previous cityhood movements of Briarcliff and Lakeside, thus creating a new map that didn’t have to wait two years before being considered. Cityhood supporters argued that their proposals had already been considered in one form or another in the 2014 session, and the rule should be waived. The Legislature agreed, though not without some worry about establishing a bad precedent for creating new cities. “This study committee is established by House Resolution 743 and will review current annexation, deannexation, and incorporation laws and procedures to ensure that the process is clear, open, equitable, and in the best interest of the citizens of Georgia,” a press release from the House Communications Office says. Beskin’s inclusion on the panel is notable because of another piece of legislation that didn’t survive this year’s session. Beskin introduced a bill that would change the process for annexation referendums. Currently only people in the area to-be annexed have a right to vote under the state law. Beskin’s legislation would change the rules so people in both the existing cities and the proposed areas to be annexed would get a chance to vote. Taylor’s inclusion is also noteworthy, because he sponsored the LaVista Hills bill, even though the proposed city is not actually in his district.